If this active inn can be demolished for single family homes, then why not the Aurora? Kevin Chambers tells us that the Aurora has no historic significance and would not be missed if it came down. Maybe this is the best option for the town. Yet the new owner supposedly wants four condos. It seems like the lawful best result would be to demolish and put up several Victorian houses. If Avon-by-the-Sea can do it, how about Ocean Grove-by-the- Sea? And if you are going to exempt any category from RSIS, it should be single family houses so that it would be legal not to require off street parking for them. What will the Township do when the variance requests appear? Will it be the same old song and dance? 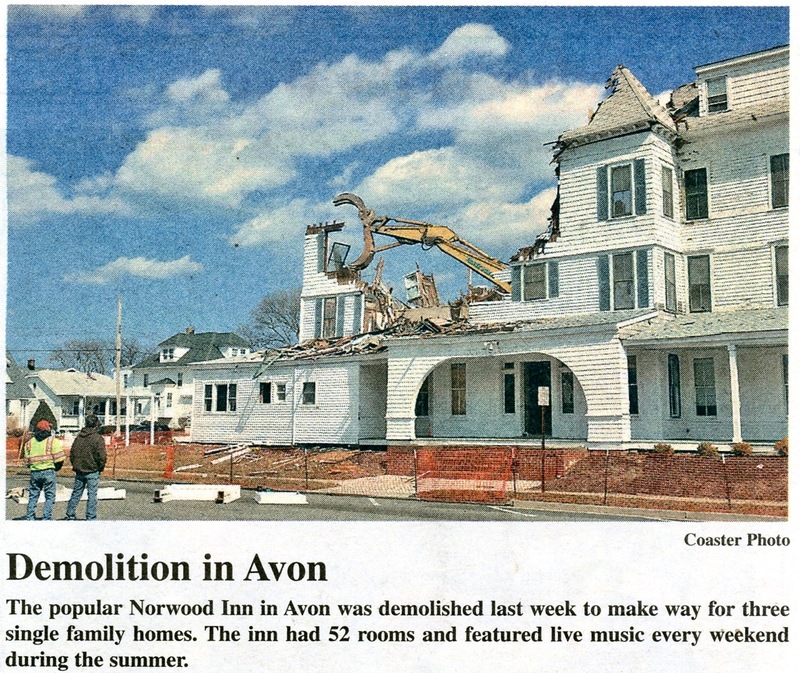 I remember the Norwood Inn from years ago when our family summered in Avon by the Sea. The Inn–advertised as an American Restaurant Dance & Night Club Bar–used 618 second Avenue in Avon as its address. The building was on the corner of Second Ave. and Norwood Avenue, hence the Norwood name. The Norwood Inn in Avon was a building with as much or more style, with original fabric, than the Aurora. When the new Avon houses are built they will probably have as much original elements as the Aurora will have once it is rehabbed. Meaning none. Avon clearly has a planning firm that follows the law and attorneys that follow the law and zoning that is in conformity with the law. All three things that Neptune does not have.